Out of all the Barney dvds we've tried Clean Up Clean Up is our favorite so far. And definitely my favorite because when they clean up I can hear some humming of the clean up song. Barney shows how to make cleaning fun; from painting the caboose, to washing windows, to putting away toys! See Riff learn new tricks when his litterbot leaves him in a heap of a mess. All the friends help BJ out of a big spill, and they work together to host a fancy tea party. Everything's better with friends, and when teamwork helps with clean-work, the world sparkles and shines! The bonus features include a game, music video, a bonus episode and the Clean Up karaoke song. 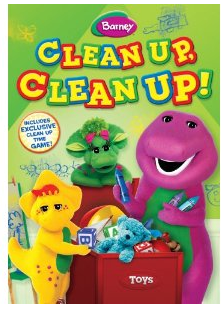 You can purchase the Barney: Clean Up Clean Up DVD for $9.49 at Amazon. Giveaway will end Tuesday April 10th at Midnight MST. Winner will be chosen by Random.org. I was given the above dvd to review from Lionsgate and HIT Entertainment. No other compensation was received. All opinions are my own. If you have previously won the above DVD you are not eligible. All information gathered for the giveaway will be discarded when over. Your privacy is important. Facebook is in no way affiliated with this giveaway. My son would LOVE this. We sing a clean up song at some point every day and he used to like it, but Barney would make it fun again! Oooooh!!! I have a serious Barney fan here who would LOVE this!!! :) Thanks for the chance! Both of my sons love Barney! I would like this for my daughter but I remember by niece, who is now 18, singing the Clean UP song with Barney many years ago! I didn't realize Barney was popular again. Thanks for the giveaway! kristiedonelson(at)gmail(dot)com Thank you. We are BIG Barney fans here! This looks great, and may help my kiddos pick up! great giveaway! we love barney! My daughter loves Barney and this would be a great Dvd for her!